Col. Sani Kukasheka Usman, Abuja: A joint patrol team of Sector 1 of 27 Task Force Brigade and Army Headquarters Strike Group today cleared Boko Haram terrorists enclaves in Buhari, Matari and Kaidiri villages located some kilometres to Damasak, Borno State earlier today. Unfortunately, the remnants of the Boko Haram terrorists at Kaidiri on sighting the patrol team chickened out and withdrew in disarray into Niger Republic with gun shot wounds. 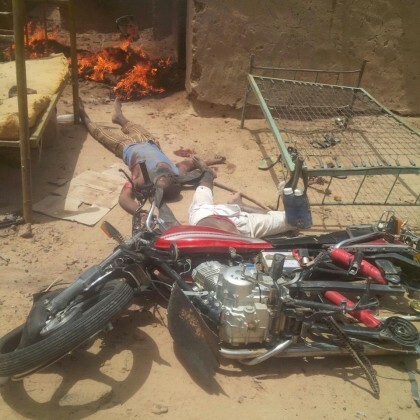 The troops pursued them and got 2 Boko Haram terrorists. In addition, they recovered 7 motorcycles and borehole equipment. In a related development troops of 7 Division recovered and successfully detonated Improvised Explosive Device planted by suspected Boko Haram terrorists that came in Keke NAPEP in Gomari, Maiduguri metropolis this evening in conjunction with Nigeria Police Explosive Ordnance Device team. This development has necessitated the call for more vigilance and security conscious on the part of everyone especially the residents of Maiduguri and its environs. The fight against the menace of Boko Haram terrorists is a collective responsibility that require positive contribution from all citizenry. People should please be wary of suspicious persons or objects and report same to the nearest security agency or post.